One of the most common questions filling our email box lately is requests for more information about cradleboards (also known as cradle-boards, baby boards, baby carriers, and, more inaccurately, papooses.) 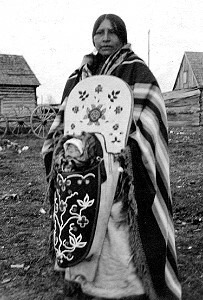 Cradleboards are best known to non-Native children from countless depictions of the Shoshone/Hidatsa explorer Sacagawea, who famously carried her newborn son on her back as part of the Lewis and Clark expedition. In fact, cradleboards have long been an important technology in the history and culture of many different North American tribes. Here are some descriptions, pictures, and answers to common questions about Native American cradleboards. 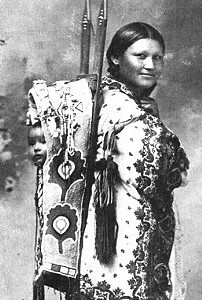 Chippewa mother with cradleboard A cradleboard is a traditional kind of Native American baby carrier. 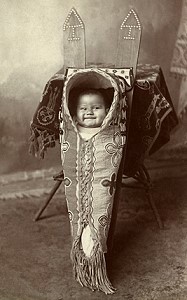 The baby is swaddled (wrapped tightly in a small blanket) and strapped to a specially designed flat board, usually made of a wood plank (although some tribes wove them from basket fibers.) The cradleboard can then be carried in the mother's arms, worn on her back like a backpack for travel, propped up on the ground like a baby chair, or secured to a sled or travois for longer journeys. After horses were introduced to the Americas, cradleboards in some tribes began to be designed to hang off the side of a horse as well. Did all indigenous American people use cradleboards? No. 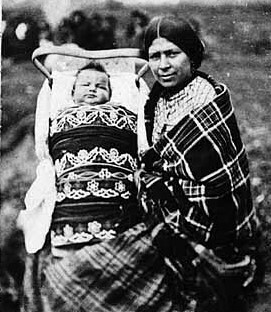 Native baby carriers were not used at all in some tribes-- families didn't traditionally bring infants out of the village in some tribes, so they didn't need a special way to carry them. 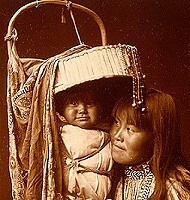 In some California Indian tribes, babies were placed in horizontal baby baskets while their mothers worked. 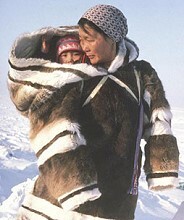 Inuit (Eskimo) women usually carried their babies on their backs, inside the oversized hood of their parkas. 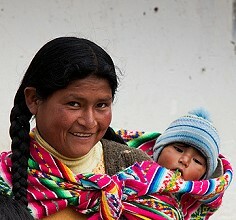 And in most of South and Central America, Indian babies are carried in slings across the mother's hip, chest, or back. 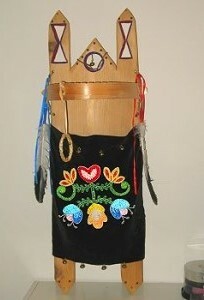 But cradleboards are by far the most common Native baby carrier in North America. Cradleboards are constructed differently in different tribes. The cradleboard frame is usually carved from wood, but some Native Americans weave the frame like a basket instead. Many tribes make cradleboards with wooden hoops attached to the top. This hoop acts like a roll bar to protect the baby's head if the cradleboard should fall over. Traditionally, some Native cradleboards were smaller and were intended to be carried by an adult (in many tribes, these cradleboards had leather straps attached so that they could be worn like a backpack.) Others were larger and had feet so that they could be propped up in one place. How do the babies stay in the cradleboards? 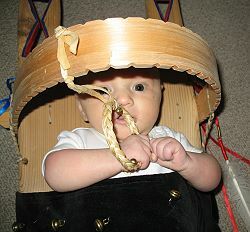 Different tribes developed different methods of attaching a baby to a cradle board. Some Native American cradle boards had a cloth or leather bag attached which was padded with moss, and the child was simply slipped into the bag, like a bunting. Other cradleboards had two flaps of leather attached to the sides, which were closed around the baby and laced up the middle. 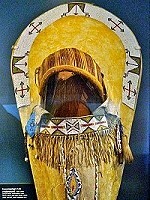 In a Plains Indian variant, the whole cradleboard was bordered in flexible leather, so that the top part would pucker into a sort of hood when the middle was laced. 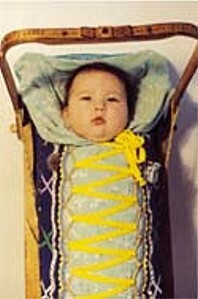 A fourth style simply used straps and cords to wrap the bundled baby tightly to the board. Weren't Native babies uncomfortable being confined in the cradleboard like that? Did older children ever use cradleboards? 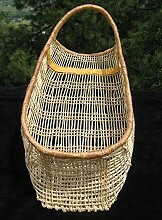 Some particularly migratory tribes did have larger cradleboards or baby baskets to carry toddlers who couldn't walk quickly enough to keep up with the group. Some of these traveling cradleboards were carried on the mother's back like infant cradleboards, but the children were not swaddled like infants. These looked more like modern hiking backpacks. Other traveling cradleboards were carried on dog sleds, travois, or horseback. Yes, sometimes! Native American families in some communities still make, buy, or hand down a cradleboard as a welcoming gift for a new baby. 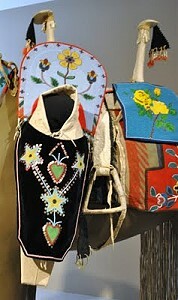 Modern cradleboards tend to be used more like regalia than an everyday practical item, but in some places they are still used regularly. Some of these cradleboards look very fancy. What do all the decorations mean? Traditions varied from tribe to tribe, but Native American cradleboards were usually made by a baby's family, and they often richly decorated the cradleboard to show their love for their baby and their clan's happiness at receiving a new member. This is a tradition that has continued today. 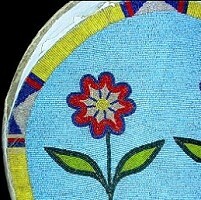 The board itself is often carved and painted, and the cloth or leather panels are frequently adorned with Native American beadwork. The objects hanging from the top hoop of Native American baby carriers have a variety of different purposes. 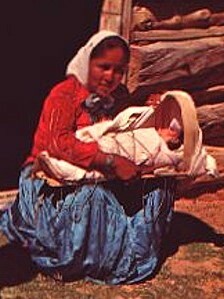 Some of them were practical-- woven blankets or strips of tanned leather served as canopies to shade babies from the sun or protect them from the elements, and dangling satchets of herbs kept mosquitos away from them. 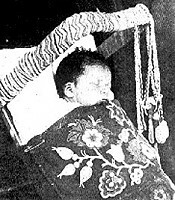 Others were ceremonial, such as a good luck charm, a beaded amulet that held the baby's umbilical cord, or a Native American dreamcatcher meant to ensure good dreams for the baby. Others, like the reed circle on Kate's cradleboard above, are intended as baby toys. Whatever their particular meaning, all of these objects have a second purpose: they are mobiles for babies to learn to focus their eyes on! Is "papoose" another word for cradleboard? No. Papoose was an eastern Algonquian word for a baby, not a baby-carrier. Some early colonists who interacted with the Wampanoag and other East Coast tribes misunderstood the definition of this word, and began calling cradleboards "papooses." No Native American people call a cradleboard a papoose, any more than you would call a carseat a baby! 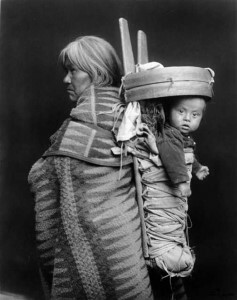 Some Native people have used the phrase "papoose carrier," especially in the past, but "cradleboard" or "baby board" are much more common. There are also many traditional Native American names for cradleboards, including the Cree and Ojibwe word Tikinagan, the Hopi word Taapu, and the Apache word Ts'aal. Can I make a little cradleboard of my own for a craft project? Doll cradleboard Yes, you can. 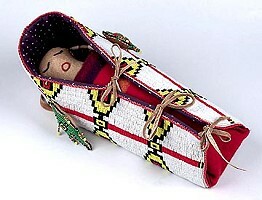 Cradleboards are a practical art form, not a religious one, and Native American girls have been making toy cradleboards for their dolls for many generations. You probably would not be able to do beautiful beadwork like the Arapaho artist who made the miniature Indian baby carrier in this picture, but you could certainly color leather strips with patterns of your own. No two cradleboards are identical, so there's no need to copy a particular design. 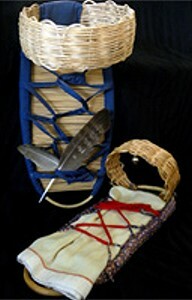 Thanks for your interest in Native American cradleboards!